I confess, I fell for this pretentious twaddle. From the early 1980’s the council of the ZNA (Zen Nippon Airinkai) – a wealthy group of Japanese Koi enthusiasts thought it would be ‘a ripping wheeze’ to let everyone know just how wealthy and how important some of their members were. 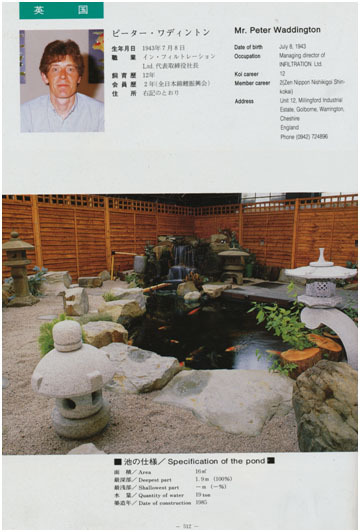 A lavish book was decided upon to highlight their members by way of showing their photographs and details of their professions together with a picture of their Koi pond on the left-hand page and a picture of their favourite Koi on the right hand page. The book itself would be updated in later years when new members came into the fold. It was produced in full colour on wonderful quality paper In A4 format. It was silk-bound and presented in a superb slipcase. Advance expectations were that some 250 members would take up the offer of being included. Soon afterwards, the members from all over the world were contacted and advised of the book. To be included, the cost would be 100,000yen (then £600.00) and high quality photographs must be submitted with the payments. In return for their insertion they would each receive a free copy of the finished book. Obviously because all this was before the Internet it took some time to collate. In the end Koi, some Koi dealers took up the offer – myself included and here’s my page. There were 250-odd insertions in it and if you wished to buy a single copy from ZNA it cost around £150.00 delivered which was a very fair price for such a beautiful presentation. As far as I am aware, the last one was published in 1995 and I think four volumes were produced. However, it was only of ‘importance value’ to the ones who were included in it, needless to say it did not produce even one sales enquiry from anywhere in the world for me!